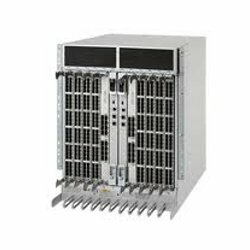 Product Description: Brocade 48-Port FC16-48 fibre channel Port Blade for Brocade fibre channel DCX 8510 Series storage area network Backbones; the BR-DCX8510-0148 features 48 ports with 16Gbps data rate per port for a total of 768Gbps local switching bandwidth and does not include small form-factor pluggable optical transceiver modules. Primarily compatible with the Brocade DCX 8510 Backbones which offer reliable and scalable Gen5 Fibre. The populated port blade with 48 SFPs is the BR-DCX8510-2048. Confidence: You can purchase this Brocade Blade with confidence - we offer a full warranty on Brocade Hardware. If you need a longer warranty, we can tailor a program to fit your needs or offer hot spares to eliminate any wait time. Trust: With clients such as Boeing, NASA, Northrop Grumman, and hospitals and universities throughout the United States, Canada and the world we have a history of client satisfaction and return customers. Give us a call for references 855-932-6627.